A custom property is a field providing information for a specific document class. 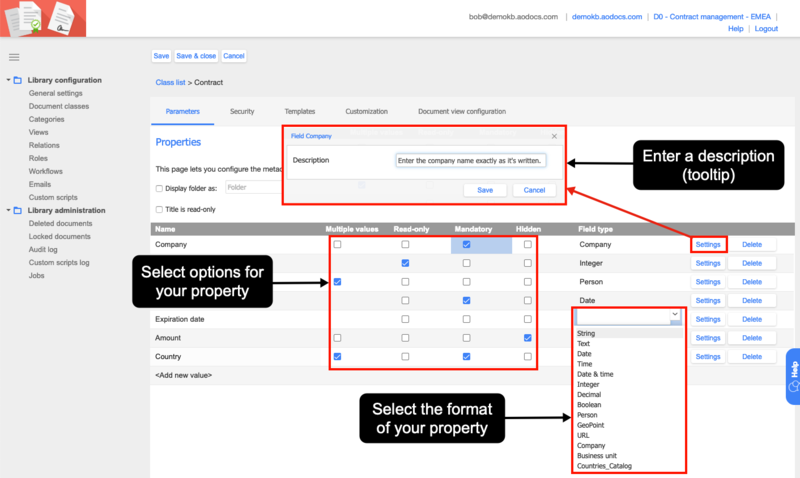 Properties can be used to structure documents, to improve the search experience and to customize a workflow. – Only library administrators can create and configure properties. – Custom properties can be defined in all AODocs library types. 2. Under Library configuration, select Document classes. 4. In all types of library, a system property Folder is set for each new document class. Note: The values you defined for the Tags category (created by default in Team Folders and Secured Folders) will be available for end-users to tag their documents without entering edit mode. Learn more: Create categories. Important: The Display Folder as checkbox isn't selected by default, so to activate folders for your library you must select it. you can select the Title is read only checkbox. Only library administrators and super administrators will be able to change the title of documents in this class after they've been created and given a title. Tip: Title can be set as read-only if an automatic naming convention is enforced on the title of the document by custom script. 5. Press <Add a new value> and enter a name for your new custom property. Date/Time/Date & Time: for date and time fields. Integer: for integer values (0, 1, 2, -1,.. limited to +/- 2,147,483,647). Note: For a Person field to accept Google Groups you must set the field as multi-valued. Geopoint: for a location in latitude and longitude. Custom categories: custom values defined by categories such as "Manufacturer" and "Country". End-users can select values from a drop-down list in the user interface. Learn more: What are categories? Note: If you create a property with the name of a category, the field type of your new property will auto populate with this category. – Custom property values can be used to trigger or validate a workflow state. – Person fields can be used as validators, dates trigger a reminder, etc. Multiple values: end-users can choose 0, 1 or several values for the same field. Read-only: only administrators and scripts can modify the value or the property. Hidden: these properties aren't displayed to contributors and readers. Hidden properties are only visible by library administrators when they view or edit a document. Note: You can't define a property as both mandatory and read-only or both mandatory and hidden. An error message appears. 8. If required, press Settings and enter a description for your properties. The description, of up to 100 characters, will appear as a tooltip on the property name for end-users. Note: You can configure data validation rules and customized help text for the following field types: Integer, Decimal, Person, and String. 9. Press Save or Save & Close. 1. The Parameters tab shows the list of properties. 2. Press the name of a property to rename it. Note: The new property name is applied to existing documents as well as new documents. 3. Select the required check-boxes. 4. If required, update the descriptions of your properties. 5. You can rearrange the order of the properties by drag and drop. 6. Press Save or Save & Close. Important: Once a field type is assigned to a property and the property is saved, you can't change the property field type. 2. Press Delete next to the property you want to delete. 3. Press Save or Save & Close.